That's what seventeen-year-old Sky realizes after see meets Dean Holder. A guy witha reputation that rivals her own and an uncanny ability to invoke feelings in her she's never had before. Her terrifies her and captivates her all in the span of just one encounter, and something about the way he makes her heel sparks buried memories from a past she wishes could just stayed buried. This book was unlike anything I was expecting and I loved it! Dean, this hopeless boy, who has lived in Austin with his father for the last year is catapulted into her life when she starts high school in the last year of her school career. Everything about him screams danger to her but they eventually spend time together and Holder is so genuinely sweet. He comes across as this bad boy, but he is so much more than that. He is passionate about everything he does and sometimes that passion can get the better of him. "You don't deserve words, Sky. You deserve actions"
They also both realise they're having some deep feelings for each other but know they are too young for love so they come up with an adorable phrase "I live you" which I loved. So cute! Along with Holder's help and her new bestest friend in the whole world (after Six heads abroad to school), Breckin, she starts to settle into high school but a turn of events starts to make her doubt everything in her life. And that is where I need to stop. If I go on anymore I will ruin this story but let's just say there are a number of huge revelations that take you on a rollercoaster ride of emotions and show that Holder and Sky are more connected than Sky ever could have imagined. I really, really, really loved this book and now I need to read the story from Holder's POV to plug in the gaps! 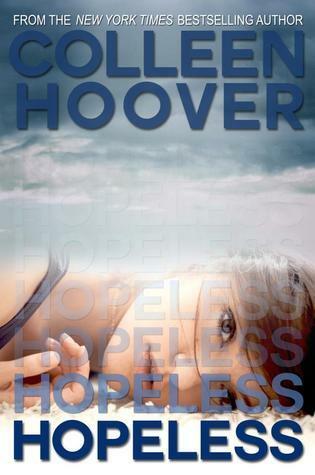 If you love books that take you on an emotional ride and are so different to what you were expecting then give Hopeless a read because you won't be disappointed.